One of the awesome things about Korean beauty is the sampling culture. 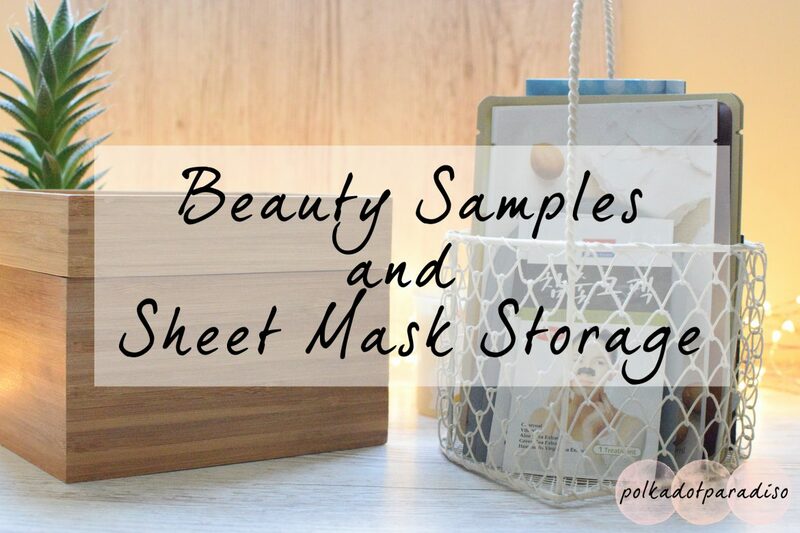 Getting a bucket of sample sachets is generally the done thing when purchasing new skincare and make up. While I’m still getting settled into a routine I’ve not been using these samples too much and instead I’ve been letting them build up. I was stuck for a while on how to store them in a non messy way. Recently though, I was sorting through my bathroom and happened upon the perfect bit of storage for all my samples. This is part of a twin set of wooden boxes that I picked up in Ikea ages ago. I like the design of this with the storage inside as well as the recessed part on the top for anything you want to store in the open. I realised that if I made some little dividers I could store my samples in here by type of product so I could find them easily. To keep this cheap and simple I grabbed some scrap card I had lying around and measured the inside of the box to work out how big the cards needed to be. I then just wrote on the different product types and slotted it all into the box. All the dividers aren’t the same size and they’re a horrible grey colour but this is perfect for what I need. The box has a lid so it doesn’t have to look pretty inside. While I don’t use many of these samples, I do travel a lot for work. It’s much quicker if I can just grab a few sachets from this box. Carting a load of bottles and pots for just an overnight stay feels a bit ridiculous. The fact that they’re organised in this way means it’s really easy for me to quickly pack. I also decided to tidy up my sheet mask and nose strip storage and repurposed this pretty wire basket that I was using for something else. This is the perfect little basket for keeping my sheet masks together. Because they’re all out as well I’m less likely to forget about any. I keep all the sheet masks together by brand. I’ve just received a delivery today of lots of new masks to try so this has filled up nicely! Behind the sheet masks I have any other masks such as lips and eye. In front, I have all my nose strips. Together, these two make a nice little combination. I’m hoping this will also keep me in check with my spending. If the wire basket is getting full, I should probably stop buying masks! I love to see how other people store their beauty goodies, if you’ve done a post on yours, drop the link below!